If you need more Free PSD Flyer Templates, check our second site. If you have an upcoming Event in a Boat, then this flyer have the same feeling & elements. 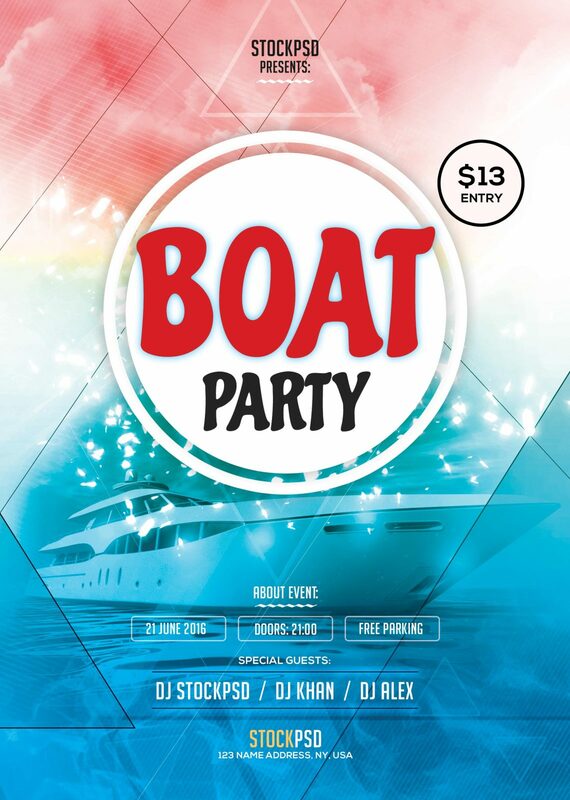 Boat Party Flyer is a Free PSD Flyer Template. This PSD File is very easy to edit, change the color, text, shapes or other elements that you can easy add/delete. This flyer have also Alternative Colors which you can change the whole flyer template by just one-click ! Help file have a guide on how you can customize colors and more helpful information. This flyer works perfect to use for any Music Event, Boat Party, Mixtape Covers or Business proposes such as Travel, Summer Events and more. You have enough space to insert any model/product image so you can present your next promotion better. To modify this flyer without any error or trouble it is recommend to have software minimum Photoshop CS4 or higher version. To find the elements and layers is not hard, since everything is organized in groups. Fonts of flyer are made with a Freebie Fonts of Google Fonts and Dafonts. In help file all source links are included for you to download in case you haven’t installed in your computer. when you provide it to us e.g. by contacting us. occasionally, from third parties such as partner/affiliate websites. Disclosure of your information to third parties: user information can be shared with partners for specific types of content and services where a client has registered their information. Other disclosures are only to the extent necessary to run our business, to our service providers, to fulfil any contracts we enter into with you and where required by law or to enforce our legal rights. Do we sell your information to third parties (other than in the course of a business sale or purchase or similar event): No, PIXELS DESIGN does not sell data. However, depending on the requested service, your data can be shared with sponsors and partners. We will always make it clear where any information provided will be shared with other parties. When you send an email to the email address displayed on our website or use our contact form we collect your email address and any other information you provide in that email (such as your name, telephone number and the information contained in any signature block in your email). We can often receive information about you from third parties. The third parties from which we receive information about you can include partners and other organisations that we have a professional affiliation with. Information we obtain from third parties will generally be your name and contact details but will include any additional information about you which they provide to us. If we suspect that criminal or potential criminal conduct has been occurred, we will in certain circumstances need to contact an appropriate authority, such as the police. This could be the case, for instance, if we suspect that we fraud or a cyber-crime has been committed or if we receive threats or malicious communications towards us or third parties. Order information: when you place an order for goods and services on our affiliate websites, we retain that information for seven years following the end of the financial year in which you placed your order, in accordance with our legal obligation to keep records for tax purposes. to withdraw your consent to our use of your information at any time where we rely on your consent to use or process that information. Please note that if you withdraw your consent, this will not affect the lawfulness of our use and processing of your information on the basis of your consent before the point in time when you withdraw your consent. In accordance with Article 77 of the General Data Protection Regulation, you also have the right to lodge a complaint with a supervisory authority, in particular in the Member State of your habitual residence, place of work or of an alleged infringement of the General Data Protection Regulation. WHAT COOKIES DO PIXELSBYDESIGN.NET USE? Cookie purpose description: Used by the content network, Cloudflare, to identify trusted web traffic. Cookie purpose description: Used by the content netw ork, Cloudflare, to identify trusted Web traffic. Cookie purpose description: Determines w hether the visitor has accepted the cookie consent box. Stripe.com which allow s online transactions without storing any credit card information. Cookie purpose description: Used to detect if the visitor has accepted the marketing category in the cookie banner. This cookie is necessary for GDPR-compliance of the website. spent on the website and what pages have been loaded with the purpose of generating reports for optimising the website content. Cookie purpose description: Contains data on the visitor's interaction and navigation on the website - This statistics service is provided by Onesignal.com. Cookie purpose description: This cookie is used to collect information on the visitor. This information will be stored for internal analytics at the website's operator – Internal analytics is used by websites to optimize their domains. Cookie purpose description: Used for gathering anonymous technical information regarding the user's brow ser, operating system, IP a ddress and screen resolution as w ell as the user's navigation on the w ebsite. Cookie purpose description: Collects information on visitor behaviour on multiple websites. This information is used on the website, in order to optimize the relevance of advertisement. Cookie purpose description: Collects anonymous data related to the user's website visits, such as the number of visits, average time sp ent on the w ebsite and w hat pages have been loaded. The registered data is used to categorise the users' interest and demographical profiles with the purpose of customising the website content depending on the visitor. Cookie purpose description: Sets a unique ID for the visitor, that allow s third party advertisers to target the visitor with relevant advertisement. This pairing service is provided by third party advertisement hubs, which facilitates real-time bidding for advertisers. Cookie purpose description: Collects unidentifiable data that is sent to an unidentifiable source. The source's identity is kept secret by the company, Whois Privacy Protection Service, Inc.
Cookie purpose description: Collects anonymous data related to the user's visits to the website, such as the number of visits, average time spent on the website and what pages have been loaded, with the purpose of displaying targeted ads. Cookie purpose description: Collects anonymous data related to the user's visits to the website, such as the number of visits, average ti me spent on the website and what pages have been loaded, with the purpose of displaying targeted ads. - This also allow s the website to limit the number of times that the visitor is show n the same advertisement. Cookie purpose description: Collects data on visitors' behaviour and interaction - This is used to optimize the website and make advertisement on the website more relevant. Cookie purpose description: Used by Google DoubleClick for re-targeting, optimisation, reporting and attribution of online adverts. Cookie purpose description: Collects data on visitors' behaviour and interaction - This is used to optimize the w ebsite and make advertisement on the w ebsite more relevant. Cookie purpose description: Registers user data, such as IP address, geographical location, visited websites, and what ads the user has clicked, with the purpose of optimising ad display based on the user's movement on websites that use the same ad network. Cookie purpose description: Registers anonymised user data, such as IP address, geographical location, visited websites, and what ads the user has clicked, with the purpose of optimising ad display based on the user's movement on websites that use the same ad network. Cookie purpose description: Used for targeted ads and to document efficacy of each individual ad. Cookie purpose description: Used by Google AdSense for experimenting with advertisement efficiency across w ebsites using their servi ces. Cookie purpose description: Used by Google AdSense for experimenting with advertisement efficiency across w ebsites using their services. Cookie purpose description: Used to register what ads have been displayed to the user. Cookie purpose description: Used by Google DoubleClick to register and report the website user's actions after view ing or clicking one of the advertiser's ads w ith the purpose of measuring the efficacy of an ad and to present targeted ads to the user. Lijit platform with the purpose of finding interested users on websites with related content. Cookie purpose description: Regulates synchronisation of user identification and exchange of user data betw een various ad services. Cookie purpose description: Collects data on the user's visits to the w ebsite, such as w hat pages have been loaded. The registered data is used for targeted ads. Cookie purpose description: Collects data on the user's visits to the website, such as what pages have been loaded. The registered data is used for targeted ads. Cookie purpose description: Used to recognize the visitor upon re-entry. This allows the website to register the visitor’s behaviour and facilitate the social sharing function provided by Addthis.com. Cookie purpose description: Collects unidentifiable data that is sent to an unidentifiable source. The source's identity is kept secret by the company, W hois Privacy Protection Service, Inc.
Cookie purpose description: Sets an ID-string for the specific visitor. This is used to recognize the visitor upon re-entry. This allows the website to register the visitor’s behaviour and facilitate the social media sharing function provided by Addthis.com. Cookie purpose description: This cookie is used to send data to Google Analytics about the visitor's device and behavior. It tracks the v isitor across devices and marketing channels. Cookie purpose description: Used to present the visitor w ith relevant content and advertisement - The service is provided by third party advertisement hubs, w hich facilitate real-time bidding for advertisers. Cookie purpose description: Sets a unique ID for the visitor, that allow s third party advertisers to target the visitor w ith relevant advertisement. This pairing service is provided by third party advertisement hubs, w hich facilitates real-time bidding for advertisers. Cookie purpose description: Used to check if the user's browser supports cookies. Cookie purpose description: Registers the ads provided by Videology that the user has seen and/or clicked. Used to generate a demographic profile of the user. Cookie purpose description: This cookie is used to optimize ad relevance by collecting visitor data from multiple w ebsites – this exchange of visitor data is normally provided by a third-party data-center or ad-exchange. Cookie purpose description: Creates a unique, machine-generated user ID. AddThis, w hich is ow ned by Clearspring Technologies, uses the user ID to make it possible for the user to share content across social netw orks and provide detailed statistics to various providers. Cookie purpose description: Collects anonymous data related to the user's visits to the w ebsite, such as the number of visits, average ti me spent on the w ebsite and w hat pages have been loaded, w ith the purpose of displaying targeted ads. Cookie purpose description: This cookie is used to optimize ad relevance by collecting visitor data from multiple w ebsites – this exchan ge of visitor data is normally provided by a third-party data-center or ad-exchange. Cookie purpose description: Collects data on the user's visits to the w ebsite, such as w hat pages have been loaded. The registered dat a is used for targeted ads. Cookie purpose description: Collects unidentifiable data, which is sent to an unidentifiable receiver. The receiver's identity is kept secret by Perfect Privacy LLC.